SEO is going from tough to tougher. You’re either trying to maintain your #1 ranking in SERPs or framing strategies to improve it. So, how’re you planning to re-strategize? Let’s first focus on On-Page SEO. In this blog, we’ll teach you 15 advanced tricks to take your web page to dominant ranks in the search results in 2019. Get ready to learn. SERP algorithms especially Google’s change frequently. Learn them thoroughly. Update your knowledge. This research will enable you to optimize the pages of your website. The more you learn, the more benefit you can get from it in the long run. Obviously, keywords are significant for on-page SEO. Firstly, find your targeted audience to get the right keywords. However, there are people who start with using keyword tools. But, if you don’t know your target audience, how can you find the right keywords? Know your audiences’ interest, needs, and demographics. Accordingly, start your search. Suppose your URL looks like this. Then, your audience can easily remember it. You need to create short and descriptive URLs based on the topic. Choose a well-crafted semantic. Avoid stuffing the URL with too many keywords. Include 2-3 keywords max in your title tag. Try to place the main keyword at the starting. Google displays the first 50-60 characters of your title. Therefore, check the length of your title. Make sure you’ve made it engaging and informative within those characters. Your meta description tells the search engine about the page’s purpose. So, determine what the page is about before writing its meta description. Also, limit the words to 160-230 characters including spaces. Heading tags denote the page’s subheadings. It makes your content easy-to-read and index able. So, pay your attention while creating these Heading tags. Include synonyms of your primary keyword in this tag. Maintain the hierarchy of the subheading tags (<H2>, <H3>, <H4>, and so on). After all, it’s your content that the audience read. Select the topics with care. Give as much information as you can. Make it interesting to read. Furthermore, write short paragraphs. Once you finish creating the content, read it out loud. This will enable you to find out whether the content has the power to drive in traffic. Inclusion of audios and pleasing yet relevant images will bind your audience for a long time. Adding videos will give you an added advantage. This content creating strategy will help you to lower the bounce rate and boost the engagement rate. Image optimization is a vital part of on-page SEO. Create their alt tags and descriptions. To reap the maximum benefit out of your videos, you’ve to optimize them. Include titles, subtitles, thumbnail images, and descriptions to enable Google to index it with ease. Take your page to higher rank with the help of Schema. It is a set of small data that aid Google in indexing and ranking your page. Place internal links in your content naturally and in accordance with the content. These links will direct your readers to other pages of your website. This amazing on-page SEO tactic is practiced for years. As for instance, you can include the link of ‘Contact Us’ page in one of your Service page. In this way, you can promote your other pages simultaneously. Client’s review adds to the credibility of your website. Your users will check reviews before buying your offerings. Moreover, it will also help you to improve you site’s rank. Make a separate Page or Section for FAQs. Write questions that your target audience may ask. Answer those questions in details. It will make your page user-friendly. Mobile users are skyrocketing. You can predict that most of the users will use their mobiles to access your site. In such a situation, if your website takes a lot of time to load or it loses the functionality, your users will go away. So, develop your website to make it responsive. 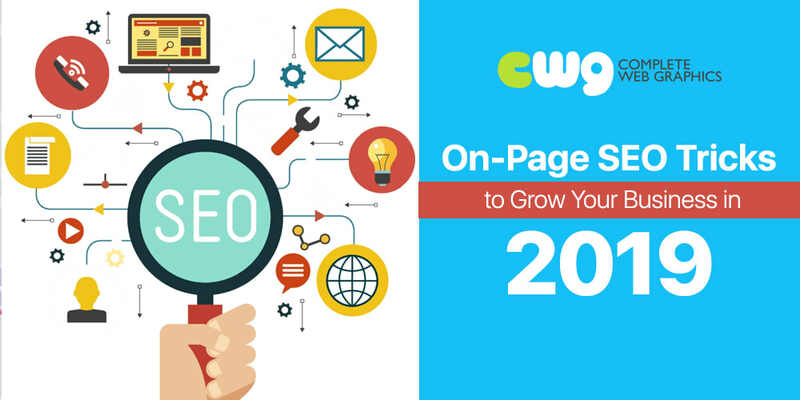 All the on-page SEO tricks discussed above can help you in generating huge ROI. Regarding it, you can talk to our SEO experts and let them frame a strategy for you. Click on https://www.completewebgraphics.com/services/digital-marketing/seo/ to know more about our services.